The path from university lab to commercialization is especially complex in the biotech industry. Challenges range from long lead times, sometimes measured in decades, to the costs of transforming ideas into innovations, as well as issues of intellectual property, patenting and licensing. 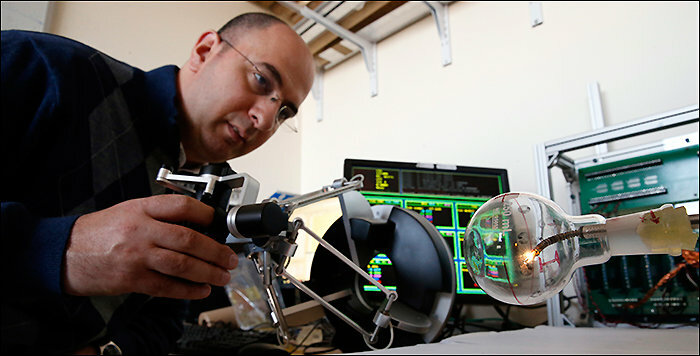 Yet Nabil Simaan, a mechanical engineering professor who specializes in designing robots to help surgeons perform operations in areas of the body that are hard to reach, does not deter easily. He has years of experience working collaboratively with commercial entities while collecting numerous patents—three in 2017 alone. Simaan's Advanced Robotics and Mechanism Applications Laboratory at Vanderbilt leads the way in advancing several robotics technologies for medical use, including miniature robots for single small-incision, cochlear implant and minimally invasive throat surgeries. "A key focus of the research is the design of intelligent robotic devices that can sense and regulate their interaction with the anatomy," Simaan said. "These robots can be used collaboratively with a surgeon to safely excise or ablate tissue." Simaan is co-inventor of the Insertable Robotic Effector Platform. IREP—a portfolio of multiple patents—is believed to be the world's smallest robotic system and was hailed as a medical science breakthrough in 2013. It is licensed to Titan Medical and led to the development of the Titan SPORT system for single-port access surgery. The minuscule robotic surgical tool enters the body through a remarkably small incision—six-tenths of an inch, or 15 millimeters. Once inside the body, it unfolds to reveal a camera system for 3-D visualization and imaging feedback, and two snakelike arms that perform the surgery.